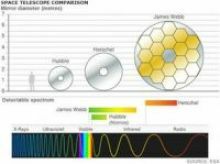 Space telescope launched in 2009 with a primary mirror measuring 3.5 m in diameter made up of 12 sintered silicon carbide segments assembled by brazing. 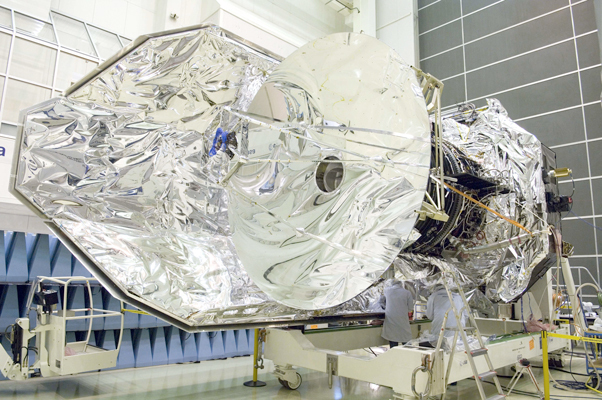 Herschel is the largest infrared space telescope ever launched. 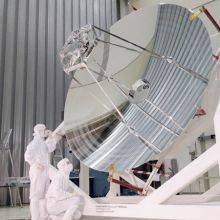 With its 3.5-m primary mirror, it is four times bigger than any previous infrared space telescope and almost one and a half times larger than the Hubble Space Telescope. Herschel's primary mirror is the telescope's light collector. It captures the light from astronomical objects and directs it towards the smaller secondary mirror. The two mirrors work together focusing the light and directing it to the instruments, where the light is detected and analysed, and the results recorded by the onboard computer. This technological marvel has been constructed almost entirely of silicon carbide. The primary mirror has been made out of 12 segments brazed together to form a monolithic mirror which was machined and polished to the required thickness (about 3 mm), shape, and surface accuracy.